My husband and I love to bicycle around our Evergreen home. We use the streets and trails and it's great, scenic recreation. That's part of our Evergreen lifestyle in the mountain suburbs just outside Denver. But, cycling has become so popular here and in the mountains that sometimes cyclists outnumber motorists especially during and after events and competitions. Some of my friends and neighbors will actually stay home on some weekends to avoid the peddling traffic. "I am terrified that I am going to hit someone. Sometimes, there are actually aggressive drivers especially during competitions. So, I just stay at home", one friend recently told me. In a recent conversation with an organizer of a popular, Evergreen bicycling event, I was told "Don't Go There." All I did was to suggest Colorado license bicycles would be a great idea to help control this expanding population of street cycles and generate some revenue for out roads. Evidently, its a controversial subject in my home town of Evergreen, Colorado. I, myself, have had several scary near incidents with the environmentally friendly bicyclists recently. Licensing the non-motorized vehicles seems like a reasonable suggestion. However, there have been many attempts to license those cycles in Colorado. All have failed. 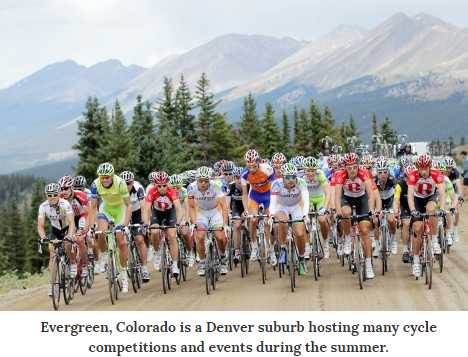 Sites estimate 1.2 million adult bicyclists in Colorado. A $20/year license would add $24,000,000 in revenues EVERY YEAR! I spoke to several folks in town - store clerks, business associates, and friends. Every person had tales of dangerous near misses and frustration from trying to "share the road." Everyone thought it was a good idea. As I bicyclist myself, I decided years ago that it was safer and more enjoyable to just stay on paths. I'm a leisure rider. The cycling warrior needs a longer, more challenging ride. I get the rush. AmericanTrails.org presented a convincing argument saying economic benefit to Colorado results in over $1B annually. This 1999 study only bolsters the fact that Colorado bicyclists are adding new revenues and taxes to Colorado's economy. We have all seen new bike shops, bike lanes, bike events, and crowds on every biking trail in the state. Bikers also demand specialized medical care, specialty manufacturing, and other new services. This is great for Colorado. So, while I still sometimes feel like the poor townie in Marlon Brando's Wild One, I've changed my mind. The competitions, events and the business they brings is good for our economy and for Colorado. I hope everyone will be cautious and careful around cyclists especially on the weekends. Ride on you bikers. Just be sure to stop for a Latte and leave a good tip.